The Santa Eulàlia festivities are organized in honor of Santa Eulàlia, co-patron of Barcelona. The days 8, 9, 10, 11 and 12 of February there are parades through the streets and squares of Ciutat Vella with giants and big heads, eagles, lions, dance groups, devils, dragons and other characters related to the festive tradition of Barcelona. And of course with castellers in the Plaza de Sant Jaume. The program of popular culture is wide. There is also an exhibition of giants, open days and activities in the City Hall, museums and cultural centers, and the Lali Jove, a specific program for young people and children. All the arsenal of the Barcelonese popular imagery takes to the streets of the old town of the city. Giants, big heads, the Eagle and many other figures. 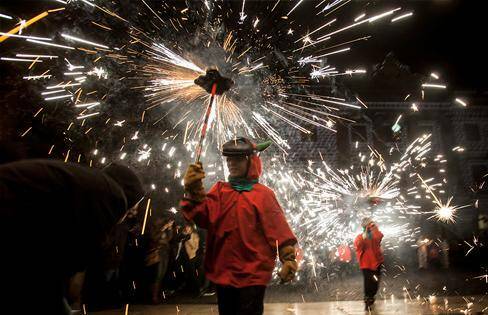 One of the most spectacular manifestations of popular culture are the correfocs; devils that parade dancing through the streets among firecrackers and fireworks, pushed by the noise of the drums. They are on Saturday 9, and there is a version for children at 06:15 p.m. that starts from the square of Sant Jaume and continues down the street of Ferran, La Rambla, passage of Colom and Plaça Reial; and the main correfoc, which starts at 8:15 p.m. in Plaza Nova, and continues along Calle del Bisbe and Plaça de Sant Jaume. Another of the most colorful activities and with ample monitoring not only in Barcelona but in all of Catalonia are the Castellers. The casteller day will be Sunday 10 at 11:00 a.m. in the Plaza Sant Jaume. The castellers "collas" (groups) that participate will have 105 minutes to raise their human castles. In addition, among the many popular activities you can meet and enjoy the dance of sardanas, concerts of gralles, bastonaires, esbarts children and youth dancers, a meeting of drummers, the mojiganga of Barcelona and many others. On the occasion of the 100th anniversary of the New Giants and the 160th anniversary of the Old Giants of the Casa de la Caritat, from 3 to 10 February between 10am and 8pm, you can see an exhibition at the Palau de la Virreina of these figures together with other coming from other parts of Catalonia and the Valencian Community. On the 9th of February and on the occasion of the Santa Eulàlia festivities, the City Council opens its doors to the citizens. A good opportunity to know the history and architecture of the building. You can visit the Black staircase, the Bon Consell Chapel, the Cròniques Hall, the Treball Hall, the mayor's office, the Bon Governor's Room, the Tàpies Room, the Reina Regent Hall, the Salón de Cent , the Consolat de Mar Hall, the Despatx d'Honor, the Carles III Hall, the Ciutat Hall, the Gòtica Gallery and the Staircase d'Honor. You can also climb the Maria Aurèlia Capmany viewpoint, located in the Novíssim Building. And these are the museums and cultural centers that you can visit for free 1 or 2 days: Arxiu Fotogràfic de Barcelona, ​​Castell de Montjuïc, CosmoCaixa, Fundació Antoni Tàpies, Fundació Foto Colectània, Fundació Joan Miró, MUHBA, Museu de Ciències Naturals de Barcelona, ​​Museu d'Història de Catalunya, Museu Etnològic i de Cultures del Món, Museu Etnològic i de Cultures del Món, Museu Marítim de Barcelona, ​​Museu Olímpic i de l'Esport Joan Antoni Samaranch and Palau Robert. Check the program below to know the days and the ones you can visit. This program, organized by the youth associations of the city, takes place at the Moll de la Fusta (Moll de Bosch i Alsina). In the afternoon, from 5:00 p.m. to 8:00 p.m., you can participate in workshops on social and personal topics such as education and sexual diversity, health, climate change, and others on playful or pedagogical themes such as board games and the practice of English. At night, between 8:00 p.m. and 1:30 p.m. it will be the turn of the concerts. During the concerts there will be awareness spaces on topics such as drug consumption or machismo.